Since the Berlin Wall came down in 1989 Berlin has again become the european city of change. Constantly rebuilding itself it is one of the most vibrant and interesting places to see in Germany and in Europe. The Helter Skelter Hostel Berlin is the new and old addition to a low budget way of taking a look behind the cliché - experience our Berlin. 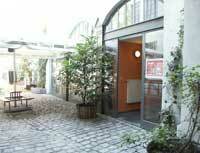 Most centrally located in the heart of berlin the hostel is the ideal starting point for sightseeing and nightlife. 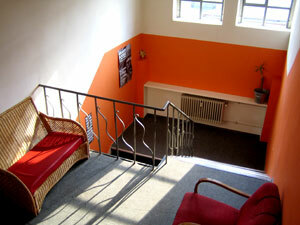 Since January 2005 we are going back to where it all started - a hostel for backpackers. Clean rooms and bathrooms, delicious breakfast, free cooking facilities in our self catering kitchen, free hot showers, free lockers, a pool table, a club downstairs and of course our bar and reception, which is 24 hours available and the international crew will make a difference. We are running hostels since 1996 now and especially the last years have seen a trend to smaller rooms and more privacy, while dorms are gettinger cheaper and ensuite bathrooms become a standard in many new opened hotel-like hostels. Where the modern traveler saves some money through low-cost carriers and can afford a slightly more expensive more private room, we felt that especially the backpacker athmosphere and spirit is fading. A multi-cultural, individual and somehow spontanious approach with the chance for surprises is what the helter skelter hostel is hoping for. You can now be a part of that - in the city of constant change - Berlin! budget accommodation, students, inexpensive student apartments, backpacker hostel, cheap accommodation, hostelling at its easiest !